Year-End Campaign Results Are In! Catch Up On Our Newsletters! Check out what we were up to at the end of 2017! At Rodney Street Tennis and Tutoring Association (RSTTA), students take the skills they learn on the courts--how to use teamwork, how to use discipline and how to focus--and apply them to the classroom. The physical activity also helps them stay healthy and active, which in turn helps them perform better academically. Call it "Rodney Court" when Tennis in the Streets takes over! On Friday, May 12th, Rodney Street headed over to Rodney Square with a host of enthusiastic volunteers for Tennis in the Streets. The mission: introduce over 1000 kids from schools in Delaware to the sport of tennis. Tennis in the Streets is an annual event held in conjunction with the USPTA, USTA, RSTTA and Wilmington Parks and Recreation. Read more about it at TownSquareDelaware and Tennis in the Streets Facebook page. RSTTA had such a blast at the Brandywine School District Elementary Fitness Festival on Saturday, May 20th! It was an amazing opportunity for RSTTA to connect with the community. Thank you to Matt Farina and all of the wonderful volunteers, vendors and families for making it a great afternoon! We hope to see some of the kids at our summer camp starting June 19th! Read more about the day on TownSquareDelaware. Click Here to Read our Spring Newsletter! 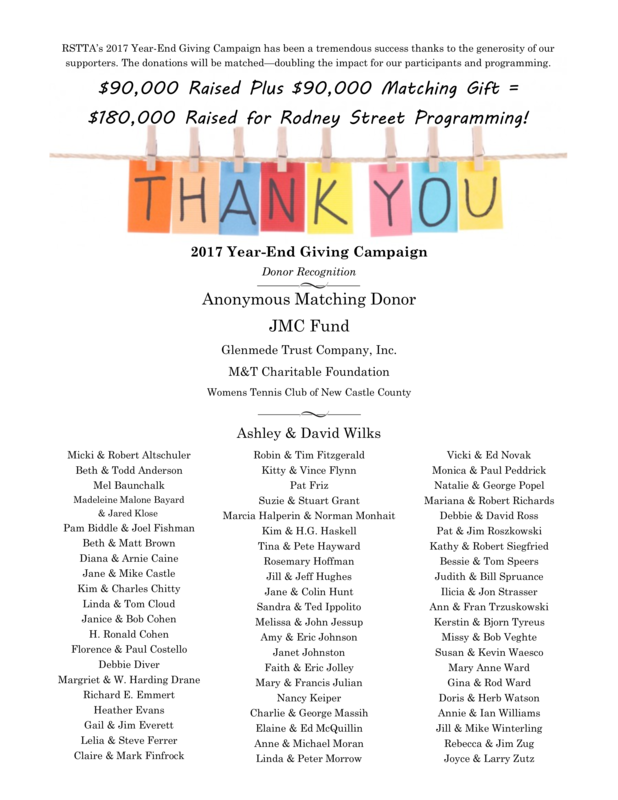 RSTTA Donors Doubled their Impact in 2016! through our matching gift campaigns in 2016.
to support children and youth in Wilmington! Click Read More below for the full donor list. RSTTA Goes to the US Open! Bright and early on Saturday, September 10th, seven RSTTA students arrived to meet Executive Director, Kim Paymaster and two parent chaperones to board a van for a three-hour trip. There’s not many places that they would travel this far to, but this time, it was for the US OPEN! “It was my first time to New York and to the US Open!”, said Robin, one of our parent chaperones. Rodney Street Tennis and Tutoring (Wilmington, Del.) was recently named one of 34 Middle States Premier Providers for 2016. Thirty-four facilities and organizations were chosen for 2016, with each being recognized for providing many of the adaptations and programs the USTA offers for its communities. Click here to catch up on what RSTTA was up to during the last quarter of 2015! Wilmington, DE (October 2015) – Rodney Street Tennis & Tutoring Association (RSTTA) is pleased to announce the appointment of Kim Paymaster as its Executive Director. Paymaster will be responsible for the overall management and execution of RSTTA’s mission, including program management, personnel and development.